If sweet potatoes can become toast, you can be whatever you want to be. lol. But seriously, the possibilities with food these days are truly endless. Sweet potato toast is not only filling, but adds an incredible flavor to a meal or snack. I take these with me to work for lunch and they give me the perfect combo of sweet and savory. I will say that this requires some serious knife skills that I myself haven’t mastered yet. In order to cut slices of toast, I cut off the ends of the potato and stand them up straight. I then cut vertically. To be completely honest with you guys, I usually only am able to get about 4 of the 1/4 inch pieces of toast out of one potato. I usually end up using my mandolin on the rest of the potato to make chips. But who knows - maybe you’ll be more successful than me! By the way - four pieces of toast is going to be really filling! I usually split this up into two meals! Almond Ricotta Cheese (that you can find here). For the chickpeas, drain and rinse a can. Add 1 tbs avocado oil, 2 tbs paprika, 1 tbs turmeric, dash of garlic powder, salt and pepper to taste. Bake in oven at 450 for 15 minutes. Toss occasionally. Place the four pieces of toast in oven at 450 degrees for 15-17 minutes. I usually flip them 10 minutes in. 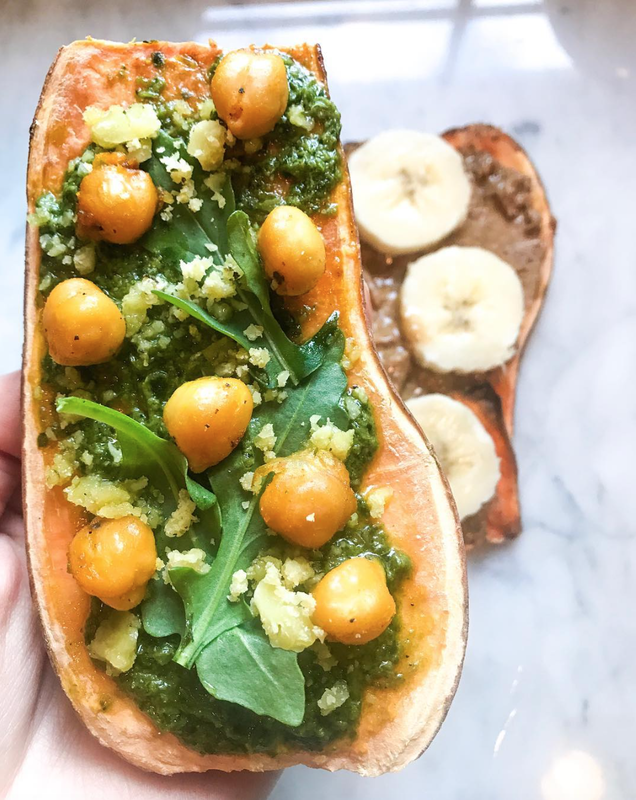 Top two pieces of toast with 1 tbs pesto each, arugula, chickpeas, and almond ricotta. Add 1 tbs of almond butter to the other and top with banana. Add drizzle of Agave if you choose.